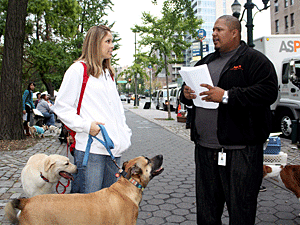 The Mayor's Alliance for NYC's Animals organizes spay/neuter, microchipping, vaccination, and pet emergency preparedness events throughout the year. Keeping your furry friends safe and healthy is your top responsibility as a pet owner. These resources can help improve your pets' health and prevent or address threats to their well-being. These New York City veterinary clincs are open 24 hours to serve your after-hours pet health emergencies. Spaying or neutering helps your pet live a longer, healthier life, saves you money, and fights pet overpopulation and euthanasia. Having your pet microchipped is one of the best ways to increase your pet's chances of getting home if he or she is lost or stolen and winds up at an animal shelter or veterinary office. New York City law requires that you license your dog, and update the license each year. When you license your dog, however, you're doing something more than simply complying with the law. You're giving your dog a ticket home in the event that she or he becomes lost. Losing your pet can be a frightening experience, but many lost animals do make it home again — especially when people work together. In the event of a fire, natural disaster, or terrorist attack, your and your pets' survival depends on your preparation. These resources can help you plan ahead for your pets in the case of an emergency.